Have you heard about the hanging coffins of Gongxian, Sichuan Province, China? The most spine-chilling part is that some of the coffins are even 3000 years old and still hanging on the cliff. Looking at the picture I don’t know why but I felt “Aasma se gira khajoor pe atkaa.” Yes, obviously it seemed very eerie too but the Bo people who followed this tradition baffle me with this way of parting from earth. Researchers believe that it saved the body from scavengers and animals but exactly what happened in the Bo tribe that they chose to hang the coffins and thereby made it a custom is a mystery. I hope someday we are able to divulge the tale behind it. 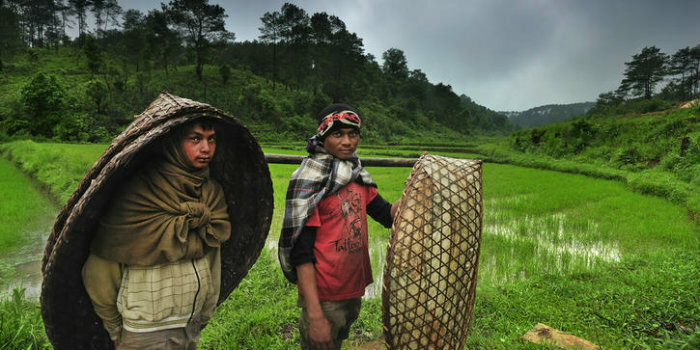 For now, I am going to take you to Northeast India in the abode of clouds, Meghalaya, to tell you a clandestine disclosing Khasi and Kwai Folktale, a tragedy that fosters a custom in Khasi Tribe. Just imagine an explosion in the paint factory of God. Prismatic butterflies fluttering, the scent of the vivid flowers enchanting your soul and topping this multi-hued landscape, the occasional drizzle comes over to wash off any minuscule grime of this heaven. Wow! Sounds unreal? 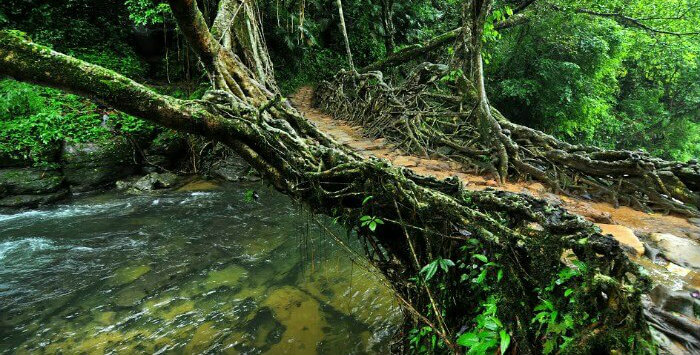 Then let me tell you that this divine abode exists in the supernatural state of Meghalaya. The periphery of your thoughts will vanish as you see the serene Rock pools, roaring waterfalls, arresting panorama of living root bridges, herds of elephants building evocative memories and scintillating fireflies as you enter this magical land. Everything here seems mystic and so are the anecdotes about the tribes. One of the Khasi and Kwai Folktale which I want to share with you can quiver your soul. It is about the genesis of Betel leaf, betel nut and tobacco and how it became the custom to offer these to every guest in the tribe. Travelling decades back into the slopes of tranquil green mountains in Meghalaya to the children of the seven huts, Khasi Tribe, you get to know about the friendship which shook the divine and arose Khasi and Kwai Folktale. Riwbha and Bidak were the two friends who were like moon and darkness, one flourishing with the wherewithal and other struggling with paucity. But their love for each other remained unmingled and pure from the mean differences. They grew up together enjoying every miracle which nature unfolded before them in the green-laced vistas from the saintly songs of birds to the enthralling swim in the river. In due course as they settled in life distance crept in though it was only between their homes and villages not between their inner beings. “Resham ke kapde par tant ka paiband nahin lagta”. Bidak sporadically went to meet his friend in his village where he enjoyed the lavish meals and humble hospitality of Riwba and his family. On one of the occasions when he returned back to his home, his wife told him about the suspicion of their neighbors who didn’t believe that Bidak had a wealthy friend. 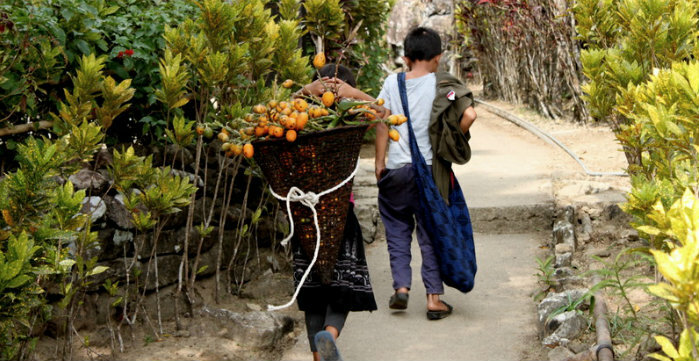 As a counteract to their qualms, he invited his friend to his home in his ensuing visit to Riwba’s village complaining that why he has not visited his house after marriage. Pacifying his friend, Riwba promised to leave for his home tomorrow itself and wished to eat the curry and rice made by his wife. Bidak happily returned to his home and shared the news with his wife. Listening to this, his wife was extremely pleased but she told him due to the sudden arrival of Riwba they are not prepared to gratify him. As per Bidak’s advice, his wife went to borrow some rice and fish from the neighbors but everyone denied her. Seeing the painful behaviour of the people, he lost his wish to live in such a cruel world where no one could lend even sparse food to serve his friend and he stabbed the knife into his chest to kill himself. Walloped with the pain of her husband’s death, she too repeated the excruciating act and embraced death. On that unfortunate night a thief came to their house for a hideout and while the night veiled the red stained bodies frozen with grief, morning disclosed the deceased. Afraid of being blamed for their death, he too slaughtered himself with the same knife. Later when the neighbors discovered the three bodies they soon were filled with self-reproach. Ultimately when Riwba came and got to know about the death of his dear friend and his wife he was smitten by agony. Can you believe three people died just because a family didn’t have food to offer to the guest? How painful is it? Like us, Almighty was also throbbed with pain when he saw this event. Therefore, he blessed the land with three plants, betel nut, betel leaf and tobacco so that at least one can offer these three things to appease the guests. Though this Khasi and Kwai Folktale from Meghalaya is very old still it seems the truth of present-day life. It is the time we wobble our souls and ask whether we would have lent some food or not? “Bada Hua toh kya hua Jaise Ped Khajur, Panthi ko chaya nahin, Phal lage ati door.” – Kabir Wani. Meghalaya an enticing destination has so much to render from pampering our soul to touching our soul with it’s Khasi and Kwai Folktale, the point is how much time will you take to embrace this special place.